Below are some frequently asked questions about Toad Data Point Workbook. And, don't forget, to check out Toad Data Point Workbook in action - start your 30 day free trial today! Q. What is Toad Data Point Workbook? Q. Do I need to purchase Toad Data Point Workbook separately? Q. Do I need to make a choice between Toad Data Point and Toad Data Point Workbook? Q. Can I use my existing Toad Data Point queries (visual queries or SQL editor queries) in my Toad Data Point Workbooks? Q. What is the difference between a Workbook and a Workflow? Q. Can I use Toad Data Point traditional AND Toad Data Point Workbook at the same time? Q. How can I learn how to use Toad Data Point Workbook? Toad Data Point Workbook is a new way of using Toad Data Point that focuses on simplifying the Query-to-Analysis workflow. Toad Data Point Workbook provides a holistic and streamlined approach to creating a group of queries combined with analysis within the context of a single workbook. No, every users that has Toad Data Point Professional or Toad Data Point Professional with Analytics automatically gets access to Toad Data Point Workbooks. Toad Data Point Workbook is installed as a separate shortcut on the user’s workstation. For Toad Data Point Professional and Toad Data Professional with Analytics users, Toad Data Point Workbook is automatically installed as a new shortcut on their workstation. The user can choose to use the traditional Toad Data Point interface or the new Toad Data Point Workbook interface whenever they want. Yes. When you go to build a “Result Set” in Toad Data Point Workbook, you can choose to copy from an existing visual query or SQL editor query. This option will make a copy of that originating query and adopt that copy to the workbook. Any changes you make to the query in the context of the workbook will not be copied or reflected back in the original query. When you start Toad Data Point Workbook, you either create a new Workbook or open an existing Workbook. Workbooks contain one or many Workflows. Each Workflow within a Workbook starts with building a result set – (through an SQL-based query) – and can contain multiple other items, like multiple pivot tables, transform and cleanse routines, report outputs, etc. 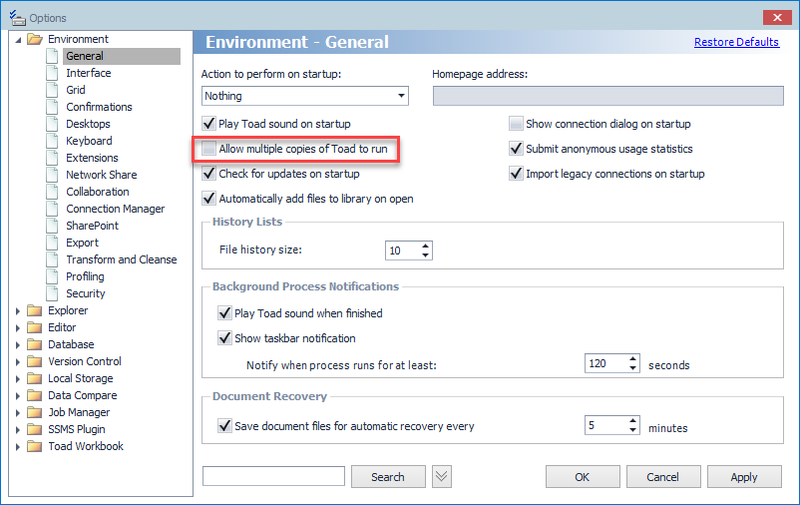 Your ability to have more than one copy of Toad Data Point running (that is Toad Data Point traditional or Toad Data Point Workbook) is governed by a user-set option. Under Options > Environment > General there is a checkbox to indicate whether you would like to be able to run different Toad Data Point sessions simultaneously – It is called “Allow multiple copies of Toad Data Point to run” – checking this means you can open up more than one copy of Toad Data Point traditional, Toad Data Point Workbook or both! To get to “Options” in Toad Data Point traditional go to “Tools > Options” , in Toad Data Point Workbook you can get to options by clicking the “Workbook Settings” settings wheel right above your workbook name. We suggest you watch all of the videos in our Guide to Toad Data Point Workbook blog post. You can also visit the Toad Data Point forums to get answers and ask questions!